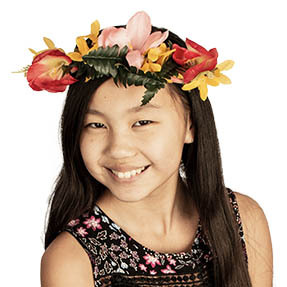 make your own crown this summer! Pull flowers and leaves off longer stems. Cut a few longer pieces of floral tape (5 in or 130 mm). Place a flower against the headband on one side. Wrap a piece of floral tape around the stem of the flower. You may need to tape a petal against the headband so the flower will stay. Start from that first flower, and tape more flowers and leaves around the headband. Once your headband is covered in flowers, test it out on your head. You might need to re-tape or bend a few flowers to make sure they look right.